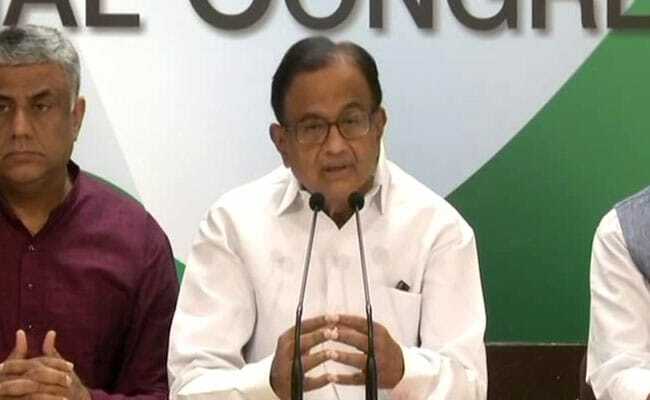 Congress leader P Chidambaram said on Tuesday the Congress would form governments in Rajasthan, Chhattisgarh and Madhya Pradesh and no one should attempt to steal their mandate. In a series of tweets, the former Union minister said the whole nation congratulates and thanks the voters of Chhattisgarh, Rajasthan and Madhya Pradesh for saving the Constitution and the constitutional values of India. "The Congress will form the government in three states. No one -- not the BJP, not the Governors -- should attempt to steal the election in any of the three states. The BJP must accept its defeat," he said. P Chidambaram said the lesson for all is: do not underestimate the hardworking, never-say-die Congress workers. "They fought an unequal battle against BJP's money and state power and they triumphed." P Chidambaram asked the BJP whether it would "change its ways". "Regrettably, there is no evidence of that so far, but we shall wait and watch," he said.